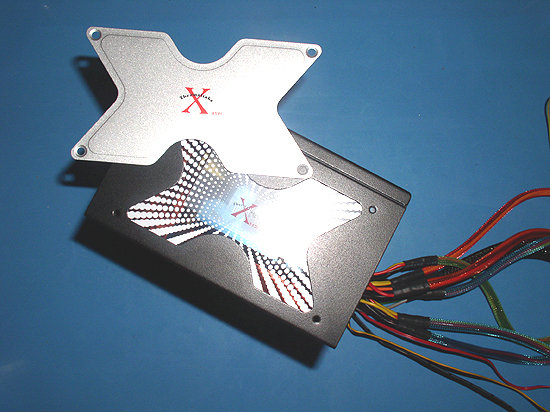 The first thing we notice when taking the power supply out of the box, is the removable "X" or "butterfly" plate. Beneath the plate is a window. I guess not everyone appreciates a window, but if you're buying a power supply with LED's in it that change seven different colors... Come on! The side panel can be taken off to expose a window. This allows the multi-colored lights to be seen from the side of a window case. The Thermaltake with the lid off. 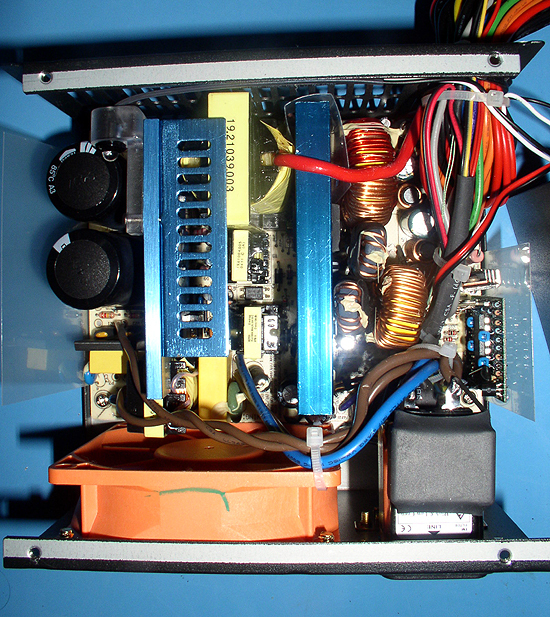 Inside, we see a power supply that is very much Sirtech. 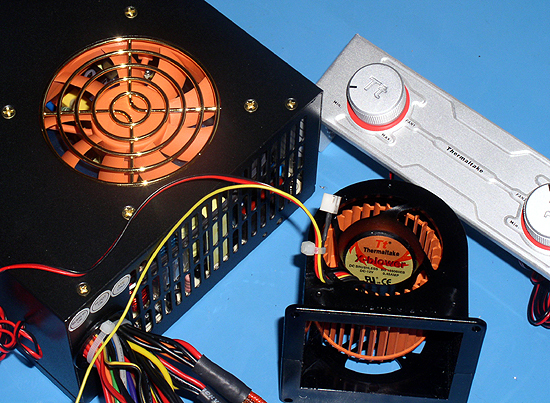 Components that are not too small, not too large. 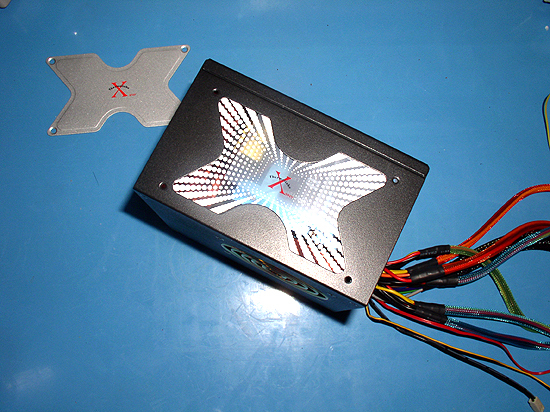 You can see in one of the photos how LED's mounted inside the PSU housing are used in favor of LED fans. Here's a side shot of the Thermaltake with the lid off. 17A on the 12V rail? Check the books.. Is that the lowest we've seen? That's pretty low. I've got 400W Ultra's and ePower's with more than that. 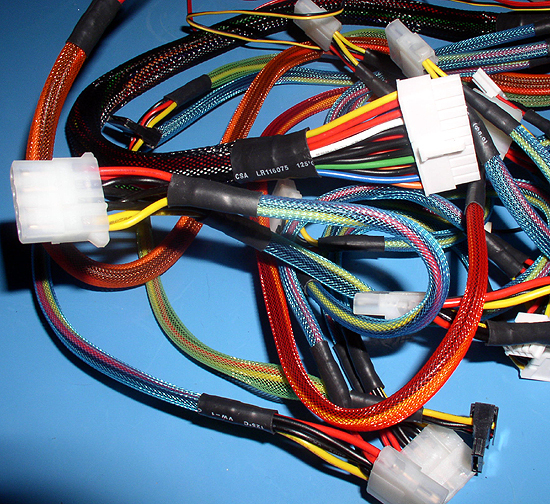 The cables all have different colored webbing on them for a multicolor look that rivals the power supply's multi-color lights. What's my opinion about what the outcome will be? I'm not too confident that this power supply will pass test one or three, since test one takes the 12V to 20A and test three up to 30A. As usual, I'm willing to give it a shot. Temperature under load = 28.6C. Temperature after power off =46C. The long and the short of it... The power supply blew up on the bench. There was no real rhyme or reason to the demise. 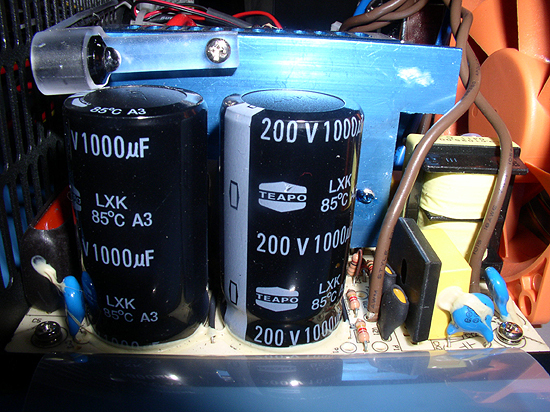 The power supply even passed test one with the 20A. My best guess is that the overload protection completely failed thus allowing me to continue to load up the rails until eventually there was a pop and a ping and the unit shut down. Unfortunately, I so much did not expect this to happen, I didn't get a chance to do a zero load test or take pictures of the power supply with it's lights running. 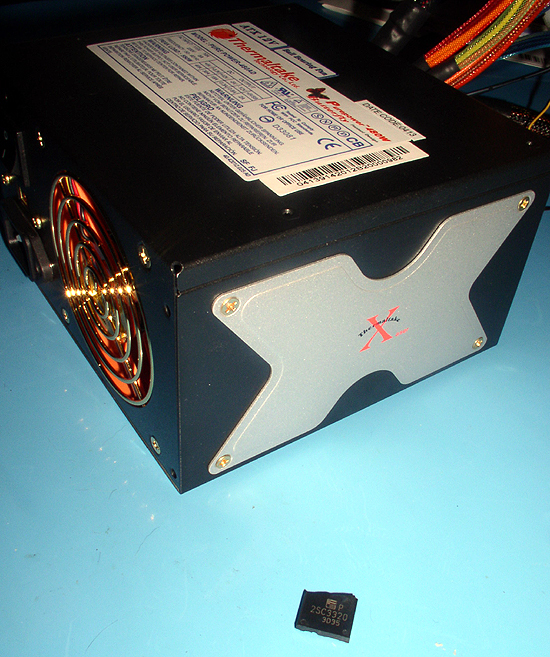 I found out what blew up when this voltage regulator fell out of the power supply. The performance concerns me. Not because it blew up, but because it only brags 17A on the 12V rail. That's just not enough if I'm paying for a 480W power supply. Move that 3.3V and 5V down a little and give me some 12V! I can't really give the power supply an "honest rating" since it ended up failing almost every test due to the explosion, but it wasn't doing well to start with simply because of the 17A 12V rail. It's being graded on a curve, but not much of one. It's average overall score is a 6.5.